After about 6 months of testing and shortly after upgrading my system to version 17.0.2 codename 'Gellivara' I thought it was time to post my experience with this distro. For those who don't know or are not yet familiar with Manjaro Linux, this is an user-friendly operating system based on the Arch Linux distro, targeted to the less tech-savvy user, for more information, distro download and more visit the oficial Manjaro Linux site here. Being Arch based, Manjaro is a rolling release, which means no big updates every year or so like other big distros, a rolling distro updates more often (automagically!) so you always have the latest version of the operating system and software under the hood. After downloading and booting the live distro, you're greeted by 'Manjaro Hello' with links to the homepage, documentation, forums and chat room as well as a guide to help the user find his way around and provides very good information about the installation process. Manjaro with the official XFCE desktop enviroment. Installing is a straight forward process with Calamares, the graphical installer, the official Manjaro release brings the choice of a pre-configured XFCE, Plasma or Gnome desktop. In my case, I'm using the gorgeous looking Deepin graphical environment. While XFCE is Manjaro's 'Flagship' desktop environment, you can pretty much install any desktop environment available out there, the Manjaro community offers their own versions with the likes of Cinnamon, Lxde and more. 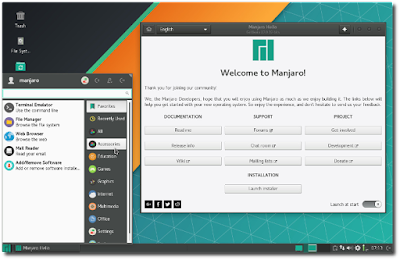 What are the advantages of Manjaro? Contrary to Arch Linux, once the user boots the live environment, it can be used right away, and installing is a breeze through the graphical installer, another user-friendly feature is the pre installation of popular software and good hardware recognizance which gives the user a great out of the box experience.